A Huffington Post article was recently circling on social media regarding a study from Oxford University about Prebiotics (yes, pre-not pro) and their connection with anxiety and depression. The article suggests there is a definite link between gut health and mental health. 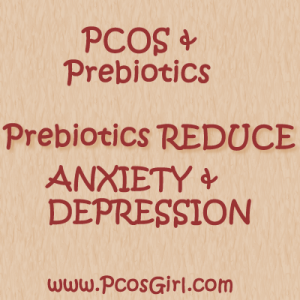 Specifically depression and anxiety, which are major symptoms of PCOS. This study gives us some hope in treating our symptoms, naturally. These days our bodies don’t have the amount of ‘good bacteria’ in our gut that they need. This is due to all the processed food and fast food in our diets. Prebiotics are naturally found in chicory root, dandelion greens, garlic, onion, asparagus, bananas, leek and wheat bran. How does this relate to us PCOS sufferers? Well many of us suffer from depression and anxiety, maybe these simple food changes can help us with these symptoms. This entry was posted in PCOS, PCOS News & Research, PCOS Symptoms & Meds and tagged pcos, pcos supplements. Thank you so much for sharing this information. I’m positive I have pcos and your website is a God-send. It really means a lot to know that someone out there (you) are helping so many people with your encouragement and information…Thanks for being you! Thanks! 🙂 You gals mean just as much to me! I felt very alone and now have an outlet and a community!!! Thanks for this article!! I too am a PCOS girl with anxiety and depression. These three things can make you feel so alone sometimes. I’m going to try to incorporate more garlic and onion, since I love both!